This town has seen better days. What happened here? Did a storm come through the area and destroy all the buildings? Where the people forced to evacuate? Or was this town created by people who couldn't live anywhere else? Are these ramshackle buildings their permanent home or do they hope for something more. Combine the accessories and buildings to make your own shanty town: * Add fencing sections around a building. * Add metal panels to the walls. * Add and rotate the buildings. * Some buildings have separate parts which can be repositioned or hidden/ shown for more versatility. * Does not include a terrain or ground. We recommend using your own shader or texture on Poser`s Ground Plane. Product Features: * Includes the following Poser figures: (obj, cr2/ png): Shanty Buildings Accessories: - Clothes Line, at 1,776 polygons. All 5 hanging clothing items are separate parts. - Container, at 182 polygons; no moving parts. - Door 1, at 86 polygons; no moving parts. - Fence Section, at 2,075 polygons; no moving parts. - Metal Panel A, at 85 polygons; no moving parts. - Metal Panel C, at 170 polygons; no moving parts. - Rubble Pile, at 1,297 polygons. Includes 3 tires and 1 pipe. - Ruined Car, at 2,075 polygons; no moving parts. - Tire stack, at 1,820 polygons; no moving parts. Shanty Buildings Set 1: - Shanty Building 01, at 3,304 polygons. Includes 2 ceiling sections, 3 front walls, 2 left walls, and front and rear walls as separate parts. - Shanty Building 02, at 630 polygons. Includes a table and 2 ceiling sections as separate parts. - Shanty Building 03, at 931 polygons. Includes a table, 2 ceiling sections, and all 4 walls as separate parts. - Shanty Building 04, at 725 polygons. Includes a porch, ceiling, and all 4 walls as separate parts. Shanty Buildings Set 2: - Shanty Building 05, at 2,169 polygons. Includes a ceiling and all 4 walls as separate parts. - Shanty Building 06, at 1,428 polygons. Includes a ceiling and all 4 walls as separate parts. - Shanty Building 07, at 534 polygons; no moving parts. - Shanty Building 08, at 691 polygons. Includes the ceiling/ overhang as a separate part. - Shanty Building 09, at 985 polygons. Includes the tire and pipe (on the roof) as separate parts. - Shanty Building 10, at 1,552 polygons. Includes a ceiling and all 4 walls as separate parts. - Shanty Building 11, at 857 polygons. Includes the ceiling, an inner wall, and all 4 exterior walls as separate parts. - Shanty Building 12, at 659 polygons; no moving parts. 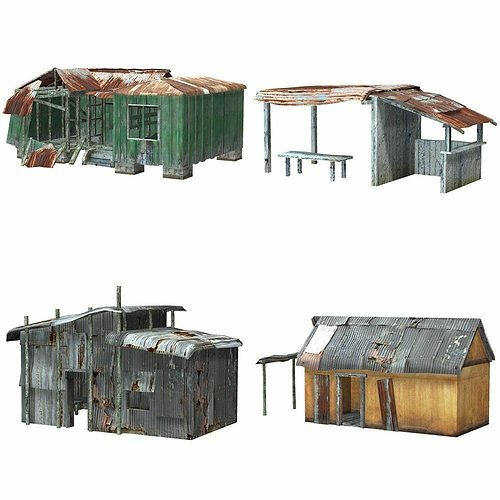 Shanty Buildings Set 4: - Shanty Building 13, at 2,269 polygons. Includes the ceiling, an opening door (with an ERC dial on the Body), and all 4 exterior walls as separate parts. - Shanty Building 14, at 880 polygons. Includes a ceiling and all 4 walls as separate parts. - Shanty Building 15, at 769 polygons. Includes a ceiling and all 4 walls as separate parts. - Shanty Building 16, at 3,152 polygons. Includes a ceiling, rubble pile, and front, rear, and left walls as separate parts. Shanty Buildings Set 5: - Shanty Building 17, at 809 polygons. Includes 2 wall "sheets" as separate parts. - Shanty Building 18, at 1,525 polygons. Includes 3 "sheets" as separate parts. - Shanty Building 19, at 1,558 polygons; no moving parts. Hide/ Show Poses: * A set of hide/ show poses for the ceiling and walls for the buildings is included. - The buildings were designed so that the hide/ show poses will work on every model, provided the building has walls or a ceiling. Textures: * One set of texture maps with corresponding normal/ bump maps, at 2048x2048 pixels. This product is designed for use in Poser 5 and above. It has not been tested for use in DAZ Studio; although DAZ Studio may import the files, we do not use DAZ Studio and can't support any issues that may occur. This model is fully licensed for use in games and apps. Also works great as background scene-filler.